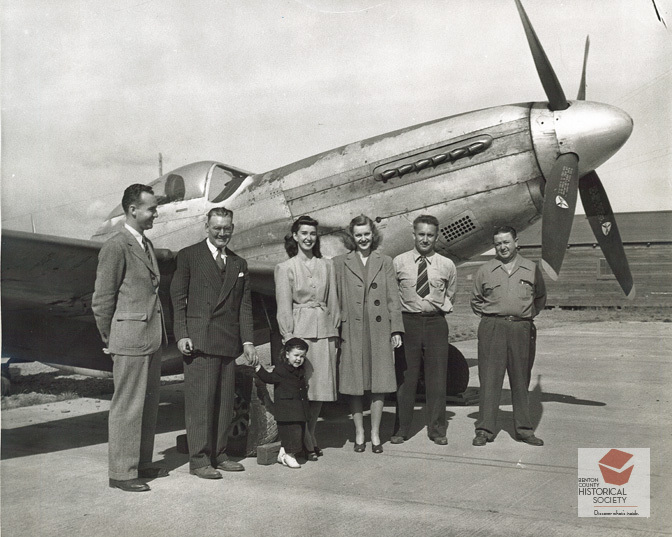 Oregon State University purchased a P-51D Mustang as war surplus in 1946 for $150 and used it in aeronautical engineering classes. Seen here, left to right are Robert Mix, Jim Hedric, Pam Cowan, Betty Ingalls, Arlo Livingston and Don Smith. North American Aviation first designed the P-51 Mustang as a long-range fighter plane for Britain in 1940. During 1944 and 1945, it was also a mainstay of the U. S. Air Force, escorting and protecting B-17 bombers as well as flying reconnaissance missions. It was the first fighter plane with a bubble canopy which allowed the crew a wider field of vision. Because of its range, speed, and agility, the P-51 Mustang, the "Cadillac of the Sky," is generally considered one of the best long-range fighter planes.